Weasels are the genus Mustela, part of the Mustelidae family. The genus includes the weasels, polecats, stoats, ferrets and minks. Weasels are small, active predators, long and slender with short legs. Their body shape is adapted to going down burrows after prey such as rabbits. There are 17 species, and they live all over the world except for Antarctica and Australasia. 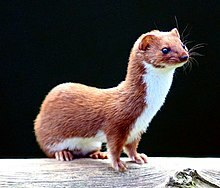 Weasels vary in length from 173 to 217 mm (6.8 to 8.5 in). They have red or brown upper coats, white underneath. Their tails may be from 34 to 52 mm (1.3 to 2.0 in) long. Biologically, despite looking a bit like cats, they are actually more related to dogs. ↑ 1.0 1.1 "The Weasel". The Mammal Society. Retrieved 18 January 2013. This page was last changed on 26 September 2018, at 15:01.